When you start your trip at the Mondrian in London, swing through the Golden Well in Prague, upgrade yourself at the Hotel Teatro Christiana in Oslo, it is not really the right context or set of expectations for arrival at Klosterhagen Hotell. For sure the staff is super friendly and the place is clean and nice, but it is a budget hotel and not really what we’re looking for here at NPS. On the positive side, we spent a day cram packed with travel on the Norway in a Nutshell tour. We were joined on the second half of the tour by some great friends and spent the entire trip talking and laughing. We were stymied by the fact that beer was not served on the fjord boat until May 1st (a very ridiculous and slightly too Norwegian thing). But we had a great time anyway watching the Japanese tourists feed the flying rats. After dropping our bags from the Leaf at the hotel, we had a very nice dinner indeed at Bryggeloftet & Stuene Restaurant right on the waterfront and serving dinner since 1910. Excellent Norwegian cuisine. Bergen turns out to be a very hard place to find an upscale boutique. 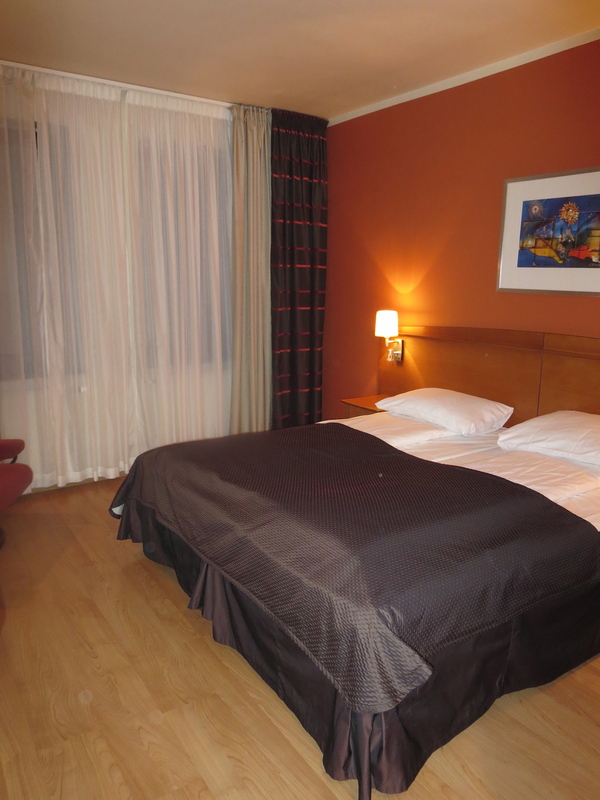 We know, because we have been here multiple times, usually landing at the Scandic for some conference or other. So we were up for a change of venue at the Klosterhagen Hotell and it is a good time to experiment we hear because there is some kind of mysterious hotel workers strike escalating in town mostly in the chains like Radisson. That did mean we only got one room instead of two (the town is packed), but really the room was so tiny that adding another body was no big deal. Yes, we’re spoiled and we intend to stay that way. We were assigned tiny room 209. The room numbering system is inventive and quirky. To add to the fun, Tuesday is garbage day, and that starts around 7am. Yays. 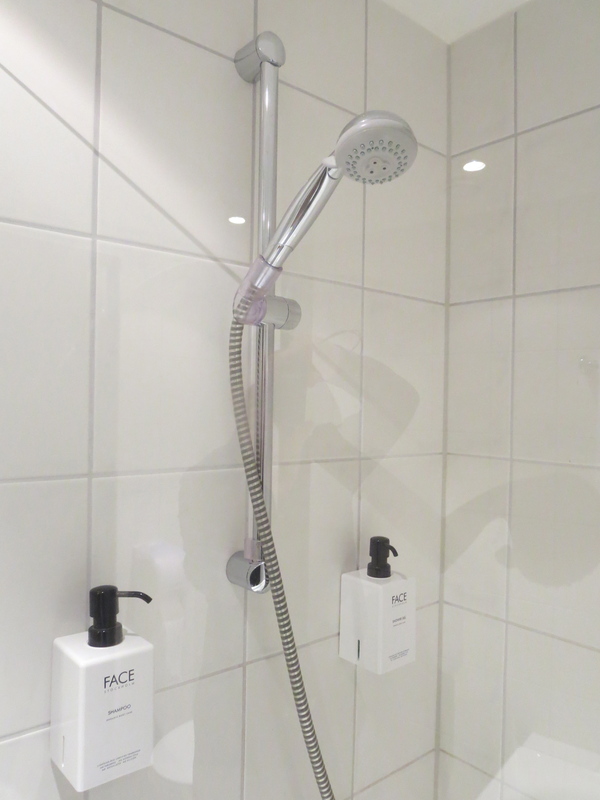 Anyway three showerheads for the Klosterhagen Hotell which is very nice, but not in the big leagues. drink plentiful amounts of alcohol and enjoy oneself with others in a noisy, lively way: they danced and caroused until the drink ran out | (as noun carousing) : a night of carousing. Yes, even the Norwegians like to carouse. 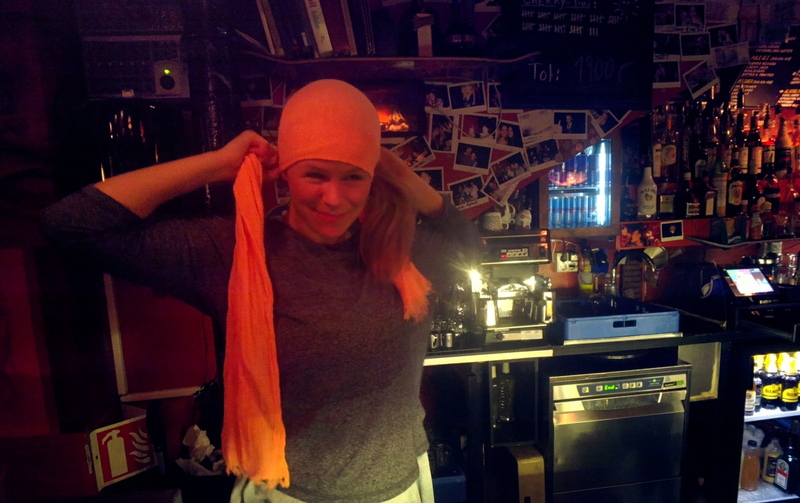 The best place to do it in Bergen is the No Stress bar (mentioned in a previous post). Once you find a place like that, you must return—even if it is Friday night. 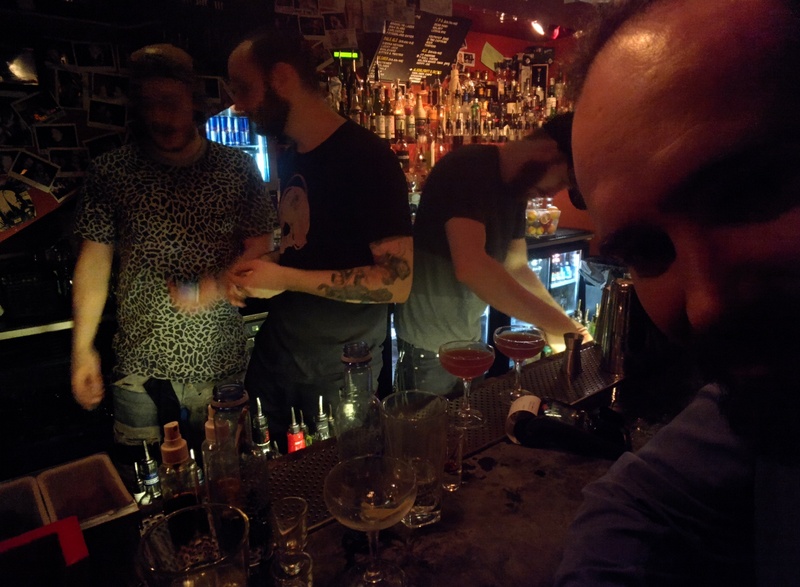 The bar was way more crowded and raucous, and I am not sure that the people behind it were not stressed. But boy was it fun. They are almost out of Pappy van Winkle 20. Alas. 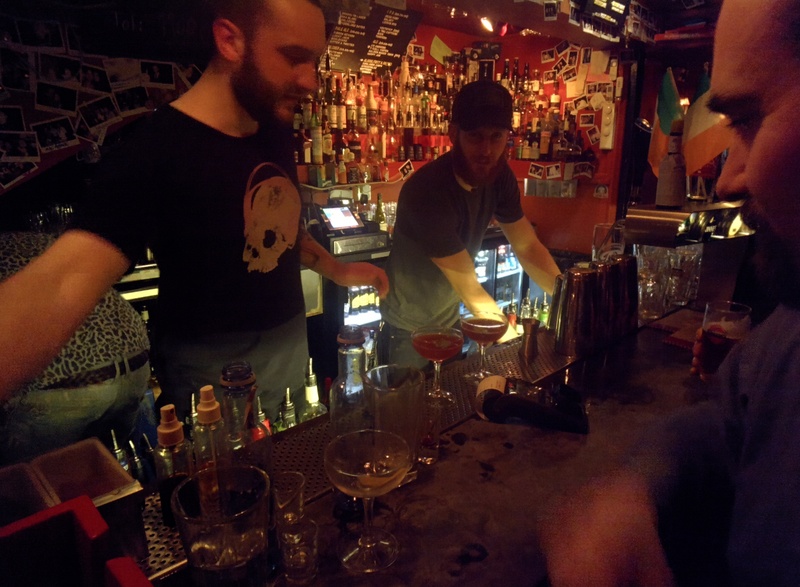 We also had a Pisco Sour, a Last Word, and some fernet branca—all classics. Video and pictures through google glass. Bergen is a beautiful city of 250,000 surrounded by mountains and water. It’s a fantastic place to visit. 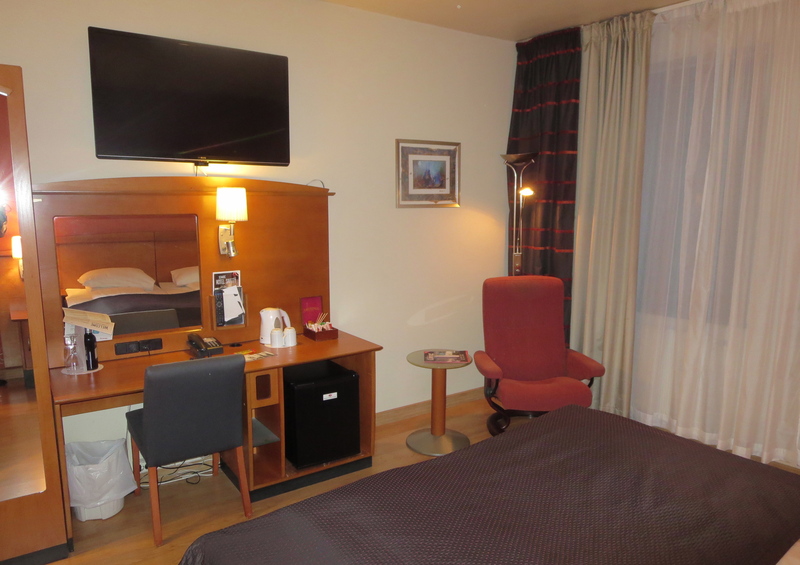 Unlike Bergen, the Scandic hotel in the city (there is one at the airport too) is a bit generic for our tastes on this blog. I suppose Scandic is the Marriott of Scandenavia. Marriotts are something we avoid. The bed has strange Norwegian bed fittings. Fun. I am in 757, which according to the map on the door seems to be a representative room. The room is clean and nice, but worn. Think beautiful lines with pockmarks and cracks. There are some nice features, including free decent wifi and power by the bed. But there are things that need repair and/or replacement. For example there is a broken tile in the bathroom on the tub and a lingering mildew smell in the air. Work pod with plenty of power. 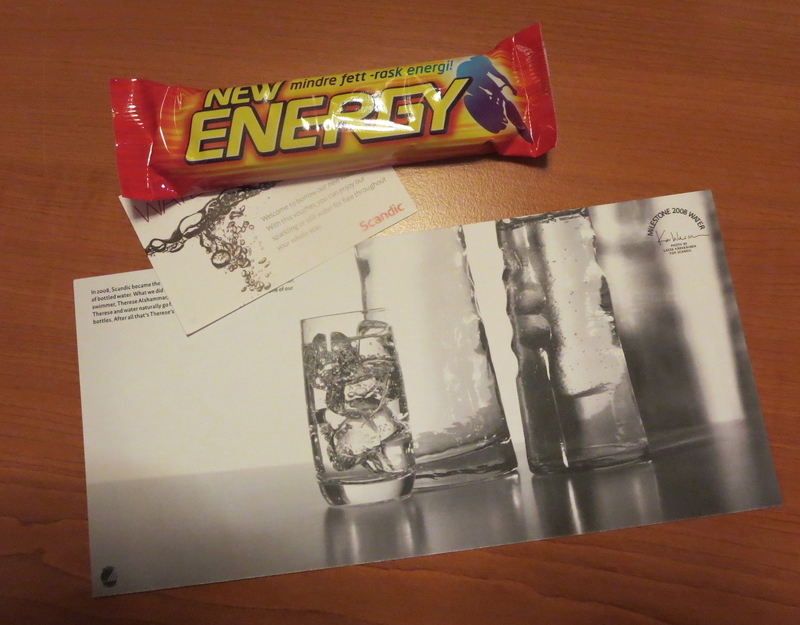 A candy welcome amenity falls squarely in the Marriott category. It’s nice that they stopped by 7-11 so you don’t have to. But candy bar? OK.
Euro-shower = non-plastic. The most interesting feature is the security disaster that is generic shared soap dispensers. Nair? Poison? Ink? Norwegians just don’t think that way. 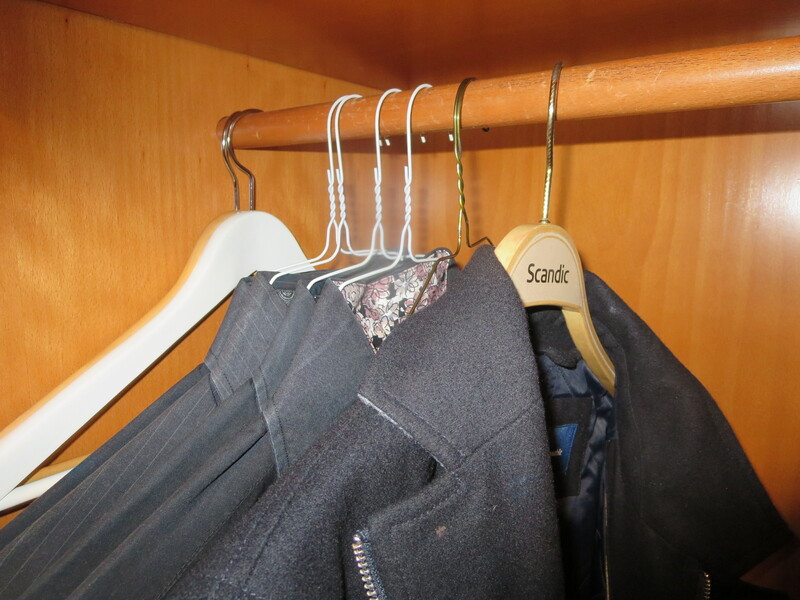 However, such a trusting nature does lead to real hangers (of which we approve). All in all a very low four showerheads for the Scandic. I’ve been here before mostly because it is a conference hotel in the city. 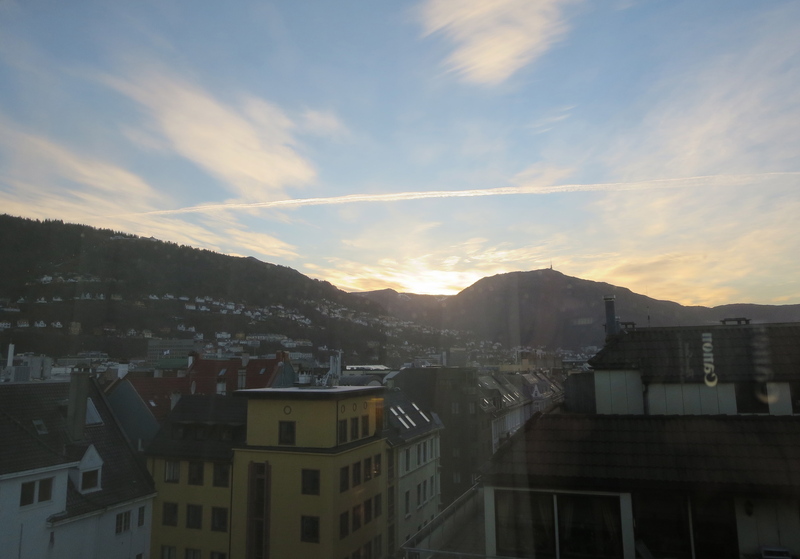 There have got to be better places to stay in Bergen though. 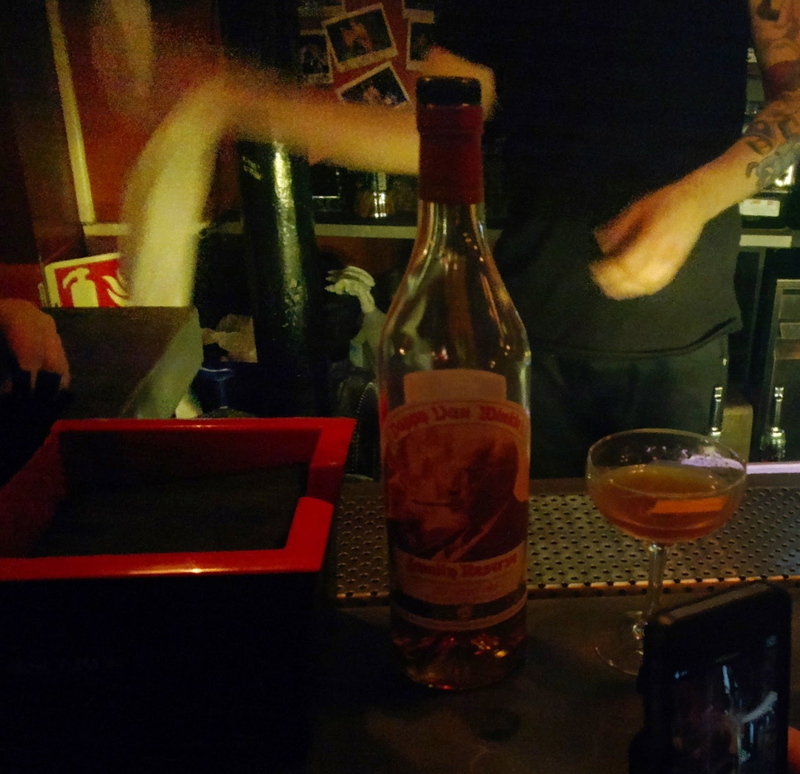 Then again, the barman at the Scandic introduced us to Tesseron Extreme Cognac, a pricey but delicious elixer whose oldest components hail from 1906–>1858 range. A late dinner at Sumo was workaday. Fine sushi, but nothing to write home about. Shake. Serve up. Garnish with an orange peel expressed.